From 2017-2018, I helped conceptualize and lead design for Webflow Ecommerce. 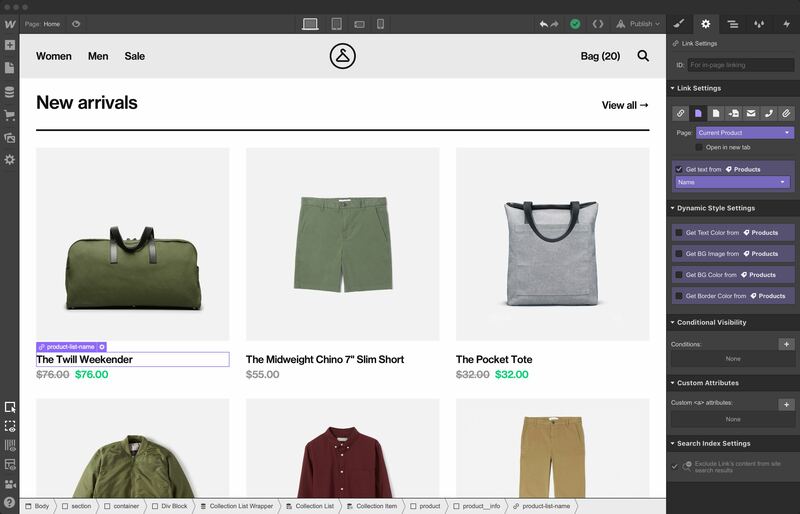 After an almost year-long effort, we released a suite of tools that allow designers to build custom ecommerce stores from scratch – without writing code. Designing a custom cart in Webflow. Most ecommerce platforms confine designers to rigid templates that offer little to no customization of product pages, carts, and checkout. The aim of Webflow Ecommerce from the outset was to challenge this model directly and give our users complete design freedom. Webflow Ecommerce was designed to rely heavily on existing interaction patterns that our users were already used to. Rather than creating something completely new, we wanted to give our users an experience that felt familiar and intuitive. The biggest challenge of this project was figuring out where to enforce constraints. Most ecommerce platforms rely on templates for a reason; custom carts can break and checkout pages don't always collect the requisite information. The entire design and development process was an exercise that involved building in constraints and stripping them out where they weren't necessary. This back-and-forth allowed us to build a bullet-proof ecommerce experience that supported degree of design freedom our users were accustomed to. 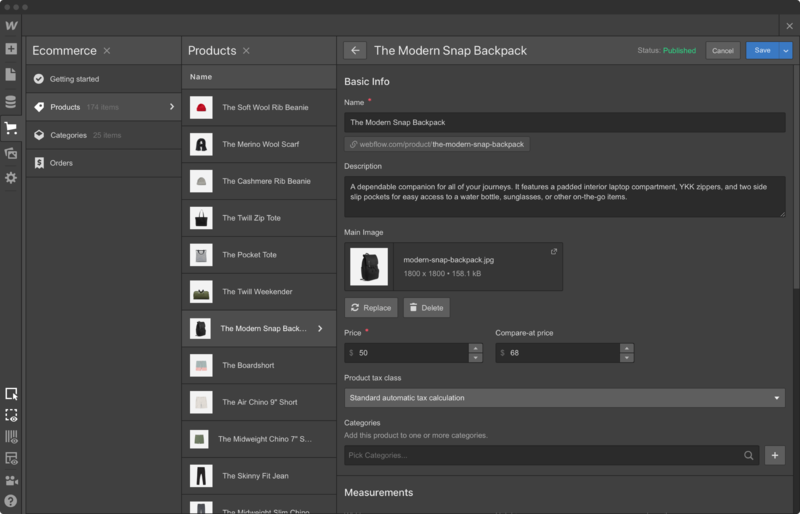 After more than a year of hard work, we released a suite of tools that allowed Webflow users to create products, design carts, create truly custom checkout experiences, build product pages, manage and fulfill orders, design and automate customer emails, and so much more. 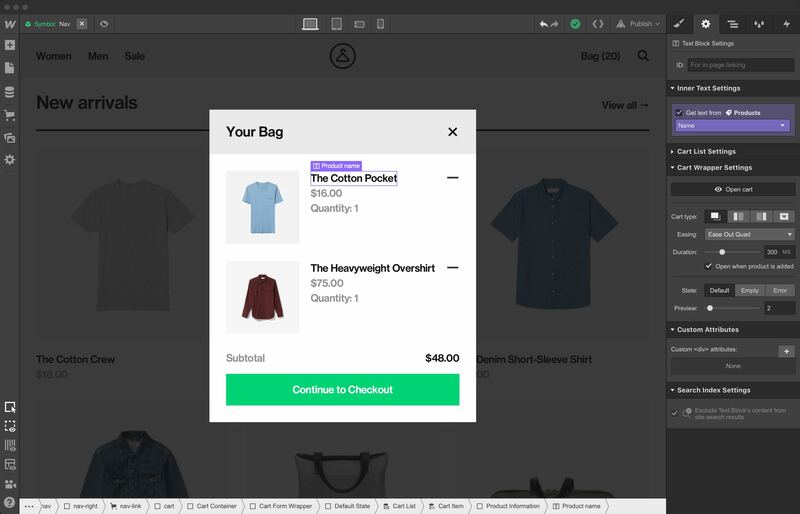 Designing a custom checkout page in Webflow.